In 2017 Sarah completed her Masters in Sports Physiotherapy and received the title of an APA Sports Physiotherapist. 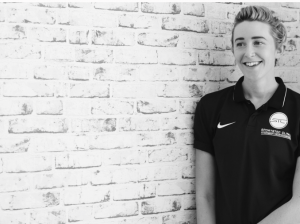 Sarah’s special interests include the biomechanics of sports related injuries (particularly football injuries), high-level rehabilitation and dry needling. As former ACTAS and Canberra Eclipse soccer player herself, Sarah has worked for a multitude of high level football teams including, the Young Matildas, the ACTAS men’s and women’s squads, Canberra United Academy, the Capital Futsal men’s and women’s squads and several other Canberra premier league teams. Just to stay extra busy, Sarah also works with the Australian Goalball team and is traveling to Sweden this year for the World Championships. In her spare time, she enjoys running with her doggy Gus and is forever on the quest to catch the gains train!